Sea horses are a perennial favorite as design motifs. It is something about their pleasing shape. 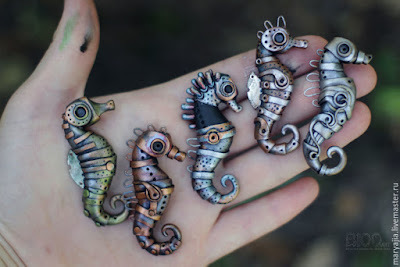 I spotted this lovely steampunk polymer clay sea horse tutorial by Russian artist, Maria Gia. Her tutorial is clever in that she introduces faux metal bands and textures in the design by using metallic paints. She also uses actual metal pieces - gears - here and there. These are encased in clay so they will stay put after baking. No need for glue. The sea horse design can be varied as you can see from the different examples. Depending on how big you want to go, the sea horses can be made into pendants or even brooches with the right attachments added. I use a large selection of Vintaj Patina paints that come in delicious colours including metallics. They would be perfect for this! Great tutorial! In fact, the whole master jewelry section is astounding. 'Master Class' is a bit of a misnomer as the huge collection has beginner to extremely difficult tutorials in everything from polymer to beading to wax casting and metalworking. I had to bookmark the site as I found nearly a dozen tutes I had to have. Thanks for this info, Miss Pearl.